It’s winter, which means cold, snowy weather for much of the country. If you’re looking for a new challenge this season, consider strapping on a pair of snowshoes. And if you’re craving some camaraderie (or competition! ), why not hop into a race? Whether you live in Alaska, Vermont or somewhere in between, most areas with snowy weather host snowshoe races. For a list of events, visit the United States Snowshoe Association. Not convinced? Check out our top reasons why snowshoe running (and racing) is awesome. You can geek out over new gear. Running snowshoes are light, narrow and essentially have three parts–the frame, the binding and the cleat. If you’re picturing wide, heavy, wicker contraptions, think again. Humans have been snowshoeing for a long time, but specialty running snowshoes are relatively new. Made from lightweight materials with interchangeable cleats and bindings, you’ll be able to find or customize an option for any terrain. And while you don’t necessarily need anything besides snowshoes, wouldn’t it be fun to treat yourself to some new leggings or moisture-wicking mittens as well? Pace will no longer be top of mind. Think of snowshoe running as a more extreme version of trail running. The terrain can be unpredictable, and you’ll be forced to slow way down. When it comes to races, it’s not your pace that matters, but your place. Instead of aiming for a nine- or 10-minute mile, set a goal like finishing in the top 50 percent or 75 percent. You’ll actually look forward to snowstorms. If you’re a road runner, nothing puts a damper on a scheduled long run like a forecast of snow, ice and cold. But if you have a pair of snowshoes, you might actually hope for winter weather. Many snowshoes have the option for deep cleats, which make running on icy surfaces easier. And if you’re planning to hit groomed trails, the more snow the better! Embracing winter rather than dreading it can make the season a lot more enjoyable. It’s fun! If your running is feeling a little stale, some time in the snow can be a great way to reset. Tromping through deep powder is no walk in the park, but it can be refreshing to ignore your pace and just focus on the joy of being outdoors. You’ll develop wicked core strength. Because of the soft and unsteady surface, snowshoe runners rely heavily on their cores to stay upright. If you snowshoe run often enough, your core will become stronger–something that can help prevent injury and ultimately make you a stronger runner. It’s a great way to ease into winter sports. Skiing and snowboarding are awesome, but there’s undeniably a bit of a learning curve. If you want to get involved in those sports, you’ll often need lessons, expensive gear and lift tickets at a ski resort. Snowshoe running on the other hand has few barriers to entry. 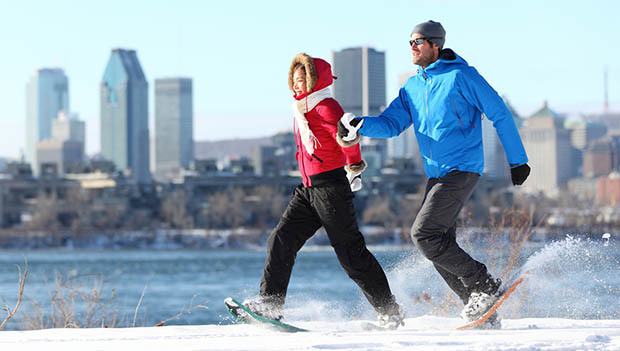 Simply buy or borrow a pair of snowshoes, dress warmly and headed to a groomed trail or empty field. The motion is essentially the same as running, although you’ll want a slightly wider stance. Even newbies can participate in the national championship race. Whether you’ve been racing for years or are new to snowshoe running, anyone can be a part of this special weekend. The 2019 U.S. Snowshoe National Championships will be held in Cable, Wisconsin, from March 8-10. Generally, the national championships alternate between the east coast (usually Vermont) and the Midwest. How’s that for bragging rights?